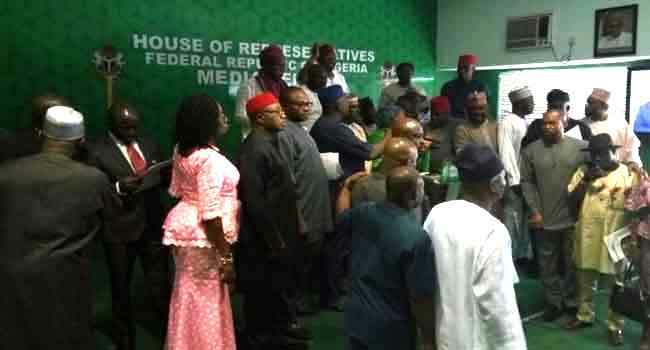 Members of the Peoples Democratic Party (PDP) in the House of Representatives have walked out of plenary over the defection of a member to the All Progressives Congress (APC). Trouble started when a member, Raphael Igbokwe, who represents Ahiazu Mbaise/Ezinihitte Federal Constituency of Imo State, declared that he had defected to the APC. After informing the House of his decision, opposition lawmakers asked the Speaker, Yakubu Dogara, to declare Igbokwe’s seat vacant. The Deputy Minority Whip of the House, Binta Bello, who raised a point of order after the defection, cited section 68 (1) (g) of the 1999 Constitution, insisting that the Igbokwe’s seat should be declared vacant. But the Speaker ruled against her position after which the opposition lawmakers angrily walked out of plenary in protest. They argued that rather ruling against their position, the Speaker ought to have called for an investigation into the provision of the Constitution on the matter. Imo State Governor, Rochas Okorocha, was also at the session to witness the defection. Igbokwe, 45, was first elected to the House of Representatives in 2011.